American Idol" picked Nicki Minaj as a judge to draw in viewers, but she's actually discouraged at least one person from watching it — her mentor, Lil Wayne. The rap star admitted Friday that he has yet to see "Idol" this season — or any other season. "Actually, I've never watched it," he said, a bit sheepishly. 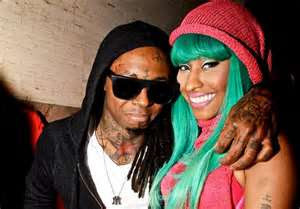 Part of the reason he hasn't tuned in to see Minaj is because she didn't exactly sell the show to Lil Wayne. "When I talk to her she's always tells me, 'You don't wanna watch that, you're not going to be into it,'" he said. "She knows me. ... It's kind of like a catfight where they be going back and forth type of thing, I'm not into all that," he said of the judging panel, which includes Mariah Carey, with whom Minaj had a much-publicized argument. "The talent on that is pretty good I heard, though," he said. Lil Wayne spoke Friday after signing autographs for more than 100 fans who were at a suburban New Orleans Macy's to support his Trukfit clothing line; a couple hundred more waited outside for a glimpse of the star. Wayne said he's hoping to soon make Trukfit for women and children. Now, it's just a men's line. Part of the problem is finding the right designer. "They send everything, every design to me, and I approve or decline, and the designer is extremely OK (with that). ... That person may have designed something, and I may say I hate it. I get no flack about it, and women are different," he said, laughing. "So we're trying to find the perfect female designer who has no problem with me declining what I don't like."